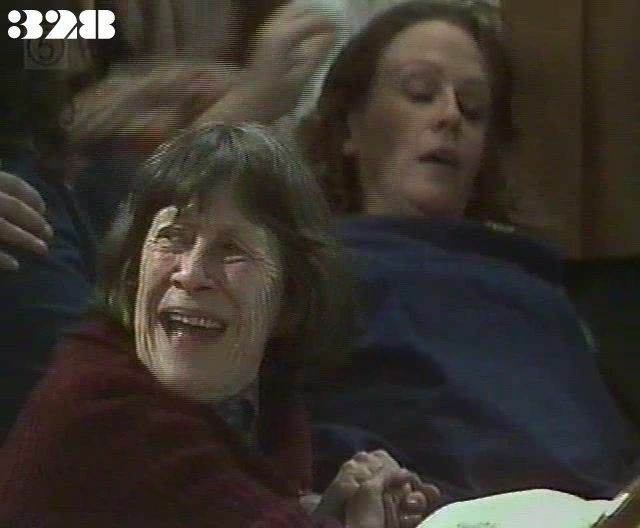 Bea learns of the death of Barbara and Mouse, and Jeannie goes into labour. Judy tells Sara she'll have to buck her ideas up and stop feeling sorry for herself. Alan's father arrives at the halfway house vowing to get Sara committed for murder and the halfway house closed. DS Farmer interviews Bea in hospital: she denies starting the fire but is taken aback by news that Barbara and Mouse are dead - and that she is likely to be charged with murder as a result. She tells him to get out and leave her alone. While the Woodridge prisoners are working to dismantle the back stage area to make a temporary accommodation area for the women, a prisoner called Les Brooke picks on Andy and hits him for no very good reason. Bea arrives at Woodridge and looks Geoff up and down, thanking him sarcastically for "making room" for the Wentworth women. Chrissie defends herself by saying that anyone could have made the mistake over the fire. Bea's reaction to the first meal she is served outside in the grounds is to spit it out on the floor at Colleen's feet: the rest of the women follow suit and throw their meals on the floor. Bea talks to Colleen to demand improved conditions, but when Colleen makes a reference to two fires, Bea is initially confused but shuts up when she realises there may be more to it than she knows. Colleen admits to Geoff in private that she thinks the women's complaints are justified. Jeannie's husband Dave visits her and brings a few gifts with him. Andy has a surprise visitor which turns out to be Paddy: for the women this is the first they have heard of Paddy's release. Paddy tells Andy that she's been to see his parents but she becomes evasive when he asks her about his father. Carlson asks her as she is leaving if there are any problems as Andy's father hasn't visited for ages. Paddy tells him Andy's father has had a stroke, but his mother asked her not to tell him. Bea demands Margo's bunk and when Lizzie is returned from the hospital to Woodridge, it is clear that someone else has to give up theirs also. Margo volunteers Chrissie, saying that after all she was the one who was responsible for Wentworth burning to the ground. Judy is woken up by one of Sara's nightmares: she tells Sara she has to stop feeling guilty for Alan's death. Maxine sneaks into Tony's bed while he's asleep, but he wakes up and pushes her away, so after an argument, Maxine leaves and goes back to the halfway house. After sleeping there overnight, she phones Spud and ask him to come and collect her. Bea repeats her demands to Colleen and adds that the women would like a TV set to break the monotony. Paddy gets a phone call from Deputy Governor Carlson asking her to visit Andy. Spud arrives and Maxine takes him upstairs , despite protests from her "poofter boyfriend". He tells her that he still wants her to take part in a robbery with him. Andy has received a letter from a neighbour about his father's illness and is upset that Paddy didn't tell him the truth. Paddy has to contact Andy's mother to get her to come and talk to Andy: she confides in Judy that she's worried that Andy will try to escape. Maxine flirts with a driver at a truck stop and offers herself in return for a lift in his cab: Spud follows on his bike. Carlson tells the women they will get work sewing mailbags. Spud parks his bike when he sees that Maxine has got the trucker to stop by the roadside and goes back to pull him out of the cab and beat him up. Maxine tries to stop Spud because he seems about to kill the driver, but this gives the driver the opportunity to fight back and knock out Spud and subdue Maxine. Tony gets a call from Maxine asking him to try to arrange bail for her. The male prisoners complain about the women getting their facilities. Andy stands up for the women and gets bashed, though probably worse than he intended. The men find out that the women are to take over their lucrative mailbag contract and start up a chant in protest: "KICK 'EM OUT". Andy is taken to hospital with a suspected ruptured spleen. Bea tries to get help for Jeannie when she says her baby is coming early but she can't make herself heard above the noise. Jeannie thinks from previous experience that she's only about half an hour from giving birth. Is this a rejected design for Wentworth's new uniforms?